Klaus Obermeyer is a bold, modern-day adventurer, visionary leader, and true inspiration to all who have had the distinct pleasure of being swept away by his brilliance. Klaus is a superbly talented cinematographer and creative commercial director, driven by finding true beauty in exploring uncharted territories and gifted in sensitively uncovering and awakening human greatness. As ocean advocate, Klaus is passionate about protecting delicate marine ecosystems and conserving the vast jungles of the last frontiers on earth. Klaus also knows how to embrace life: days are filled kite-surfing, scuba diving, freediving and skiing. Klaus lives an extraordinary life pulsed by seeking a state of deeper being and understanding and sharing that with the world. This quote kept resonating in my mind as I flew from Honiara over the Solomon Islands to Munda on a film/dive expedition I was directing for Canon and their ME20F-SH low light camera. 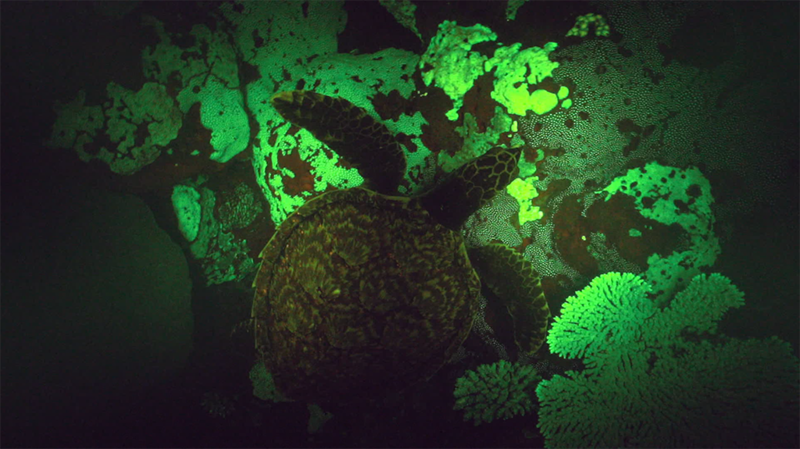 Renowned biologist Dr. David Gruber had stunned the world when he discovered the first bio-fluorescent turtle at night during an expedition to the Solomons the previous year. 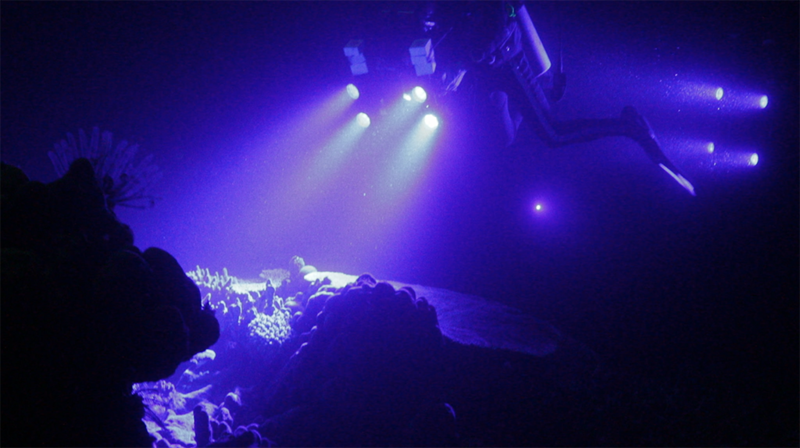 Canon wanted to shoot something amazing underwater that showcased the low-light capabilities of their technology and I suggested to Grey (Canon’s advertising agency) on the idea of filming the bio-fluorescent turtle Dr. Gruber had discovered. To my delight, they got excited about it. It is not everyday that I convince a large multinational company to travel 45 people for multiple days from around the world to gamble on the chance of finding and photographing a bio-fluorescent turtle somewhere at the end of the Earth. Needless to say, I was already feeling quite lucky and honestly still enjoyably inebriated in quiet disbelief. As a very young boy I often spent my time rotating the globe around and around in our living room and trying to determine what the most interesting places on Earth would be and I distinctly remember imagining that the Solomon Islands must be incredible because of their isolation, the vast number of islands and their proximity to the warm equator. I sensed that the Solomons were still wild and largely undiscovered and I was right. I had often travelled to Hawaii as a young child and experienced how beautiful warm water and tropical South Pacific islands could be, however, I would always imagine and deeply contemplate what it must have been like to be the first ever to discover them, before people had ravaged them. Since then I have always yearned longingly to get that opportunity of true discovery somewhere and sometime in my life. All those memories were playing in my mind as I excitedly watched countless untouched islands and healthy reefs fly by from the window of the only Dash 8 aircraft in the entire 1000 Solomon Islands as we began our descent into Munda. I was excited and ever so slightly stressed for many reasons not the least of which was the risk of not finding competent dive professionals or even seeing a turtle after I had gotten everyone excited about this crazy idea not to mention all the hype on the internet of malaria, dengue, crime and saltwater crocodiles (that theoretically hunt the same turtles at night that we would be trying to film) but all that just contributed to the euphoric adrenaline high that was building as we touched down. Within the first steps off of the airplane I was introduced to Belinda Botha who had taken over a small dive shop the year before and had trained a team of locals into a powerfully competent and passionate group of dive professionals. I immediately felt relieved meeting Belinda as her confident introduction and radiant smile melted away any doubt about the dive team upon whom the success of the entire job would be depending. We then all walked a few hundred yards from the dirt strip through a tiny town center to Agnes Gateway Hotel, which would become our charming new home and our base of operations. It became immediately clear to me that Munda and the Solomon Islands in general were on a knife edge that would either fall to the side of continuing to exploit their resources to rapacious logging companies and succumb to shortsighted greed, or they would take a path of eco-tourism and resource conservation which would preserve the natural beauty and magic of the islands for generations to come by bringing prosperity and long term employment to their people. It became instantly clear that Belinda and her brilliant dive operation were the key to that bright future as divers in search of real adventure have the resilience, passion and disposable income to travel the extra mile for an amazing experience and they deeply appreciate untouched natural beauty and underwater wildlife. The past year had already shown proof of concept in that Agnes Gateway Hotel had seen a huge bump in occupancy from Belinda’s dive tourism and she had employed a team of ten locals in her dive shop alone, not to mention the extra housekeepers, cooks, hotel staff and business to local shops, artisans, fisherman and farmers that benefit from dive tourism. I knew that by providing film and photography of the amazing dive sites, WW2 wrecks, healthy coral reefs and unspoiled islands; those images could be used as a powerful tool for Belinda to increase sustainable tourism, which would ultimately lead to a path of conservation and long-term economic success for the local people. 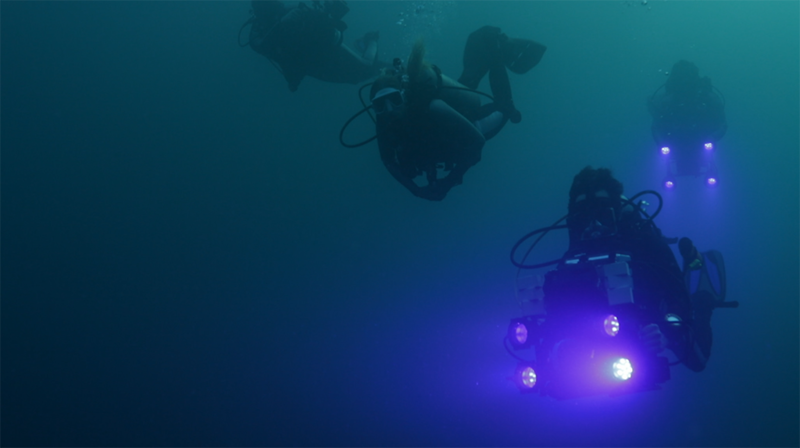 So we decided to shoot during the day to capture images of her awesome dive sites and use our nights in order to accomplish the job of filming a bio-fluorescent turtle for Canon. It turned out to be the most amazing diving adventure of my life, by far. 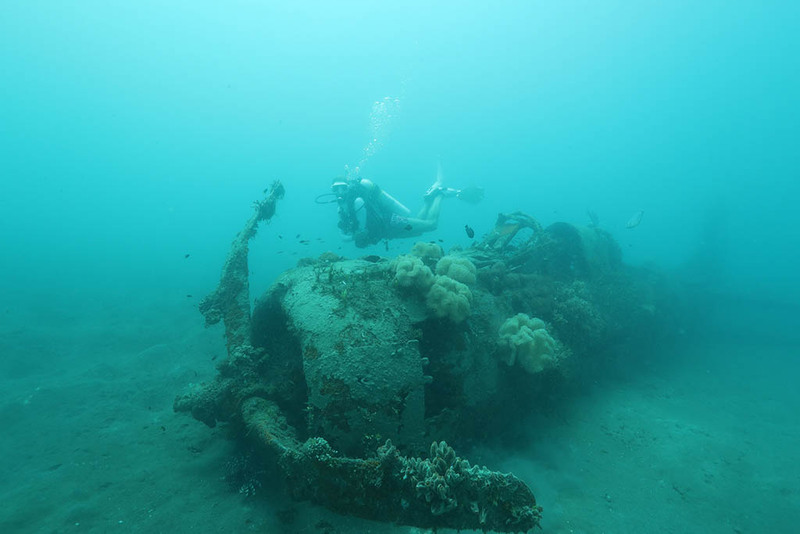 Besides the completely otherworldly coral reefs and wall dives, the Solomon Islands were the site of the most ferocious air, land and sea battles, which changed the course of WW2 and multiple hundreds of aircraft and ships, remain missing and undiscovered in the surrounding area of just Munda alone. Belinda guided me on several dives, one of which was my deepest dive ever, at 170 feet. 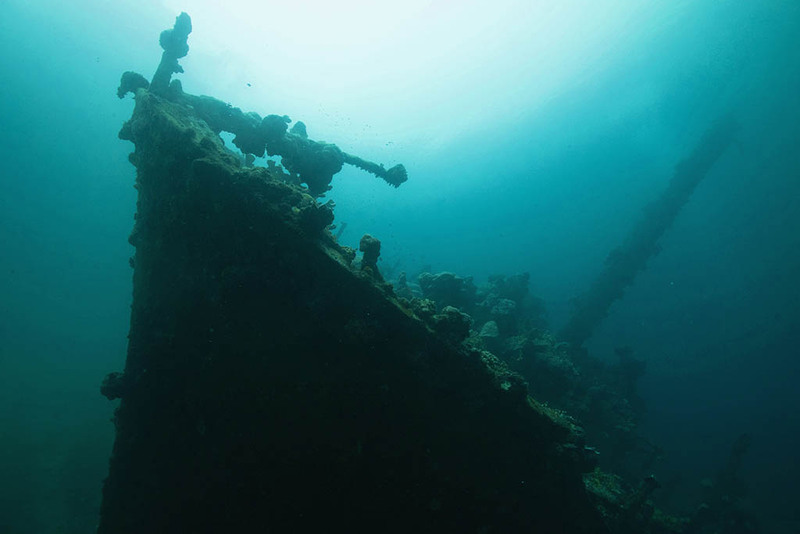 We went on to dive multiple World War II wrecks, including airplanes and a Japanese supply ship, the Kashi Maru, that had been sunk right off shore. We also dove the coolest cave that defies the imagination. The entrance of the dive is situated within a small island 40 feet inland from the shore; we hiked our equipment in over land to get to the small entrance and dove down through a spectacular cave opening with photogenic cavernous sections to a depth of 100 feet. The dive ends up leading back out into open ocean through a vacuous underwater cave exit. Once you are birthed back into the light and into Open Ocean (at a depth of 100 feet) the dive then transforms into an incredible shear wall dive for Pelagics. This location and dive profile are completely unique in the world and currently in danger of being destroyed by a Chinese shrimp farm if the government approves it. We must share this incredible dive with as many divers as possible and get this unique treasure protected. At night we would dive Mbigo Mbigo for its amazing clarity, unmatched coral formations and turtle population. 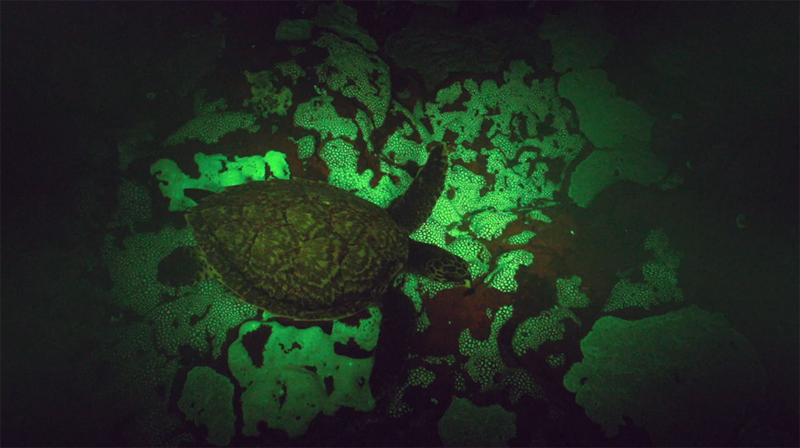 By shining blue light on the corals and turtles combined with using a yellow filter on the camera we were able to see incredible bio-fluorescent life forms and uncover the mystery of how turtles see their underwater world at night. Using the Canon ME20F-SH, we ended up shooting the most incredible bio-fluorescent turtle footage ever captured on the first and second night, which completely released stress for the entire team and allowed us to focus calmly on telling the rest of our story with brilliant night cinematography of our expedition team. Happily, our clients left the island with revolutionary footage and resounding success as a reward for their faith in our expedition. I could not bring myself to leave Munda with the group and decided to stay to make a subsequent expedition to the remote island of Tetepare a few hours from Munda by boat. Tetepare is the least developed and most remote island in the Solomons and is home to vast untouched jungle, monitor lizards, Dugong, crocodiles, leatherback turtle nests, green and hawksbill turtles and countless species of fish, butterflies and frogs just to name a few. It is also the home of a conservation group that focuses on helping leatherback and other turtles successfully hatch and Tetepare is one of the only bright spots in the future of those endangered species. Its remoteness is both a blessing and a challenge to conservationists who brave the elements to carry out their year round work but desperately need funding support to continue. We shot a short film to help communicate their mission to donors. Tetepare has a very small eco-resort that is designed to let tourists participate in turtle tagging and nest protection to create a sustainable source of income to power their conservation efforts in the future. Our overnight stay there was amazing, with inspiring people and stellar food. 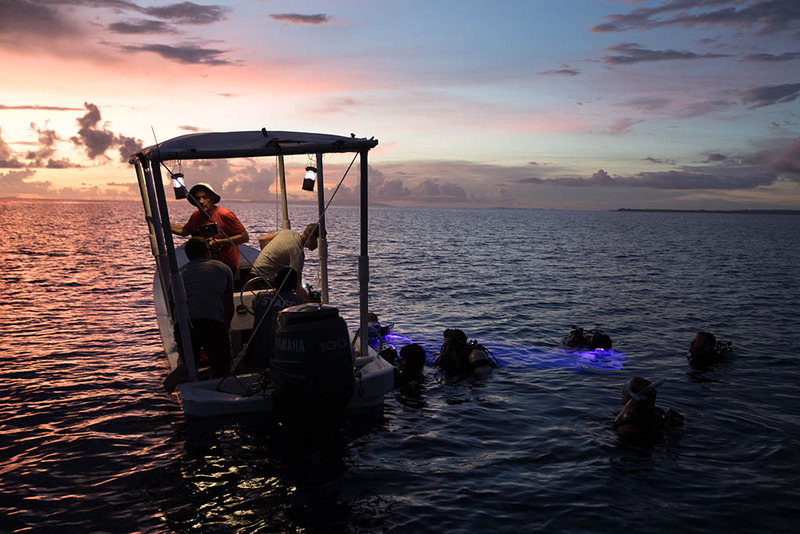 Most profoundly for me personally was that I was truly able to realize my childhood dream of being the first to discover and dive completely virgin and never before explored underwater landscapes thanks to Belinda and her team. We established three new world-class dive sites together around Tetepare that she insisted I name. Our first was “Tangerine fields,” inspired by the Beatles song “Lucy In The Sky With Diamonds” written about a psychedelic journey to an otherworldly place, which is exactly what that amazing dive felt like. Then “Magic fingers” which is a dive through tight fingerlike canyons that extend out from shore and provide a brilliant labyrinth of discoveries and amazing photographic opportunities and finally “The Blue Wall,” which was my personal favorite as the picturesque wall descends into the abyss, where tides move massive amounts of water from deep open ocean into and out of an epic island chain. We saw a large Hammerhead shark, and many others feeding at dusk. The wall itself was covered in amazing coral structure and felt healthy and teaming with life. I wish I could dive it everyday! 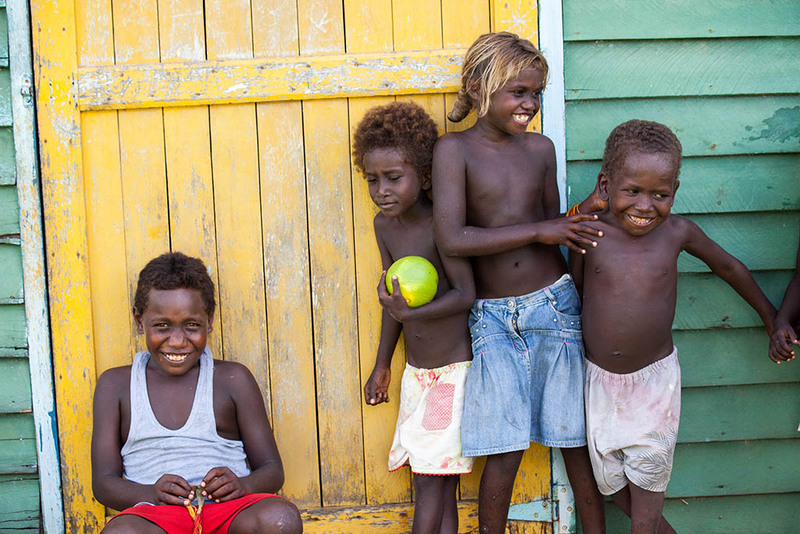 The untouched natural beauty of the Solomons is felt in the people I met, as well as in the landscapes themselves. We stopped in the small remote village of Sasavele and were greeted by many smiling children and villagers who were open and playful. They were happier holding their hand made sling shots and playing hide and seek than any kids I have seen in the “civilized world” who all seem to sit alone in a room full of people, glued to their smartphones like digital Zombies. These kids were connected to each other, the natural world around them and to their entire multi generational families who would all be living under one roof. It made me question why the modern world considers living separate from your family to be progress. Skull Island is where Headhunters would deposit the skulls of their enemies and revered local tribal leaders in the not so distant past. The conch shells on the gravesite are in perfect shape and still create the same haunting signal that the headhunters made to boast the number of skulls that they harvested on their journey. When I was invited to set foot on to this exotic and sacred island, I was moved by a palpable sense of how recently some of those skulls had been brought there and by the violent axe wounds visible. It was a reminder of how far off the beaten path we were and how special it was to be one of very few people ever to be in this place. I have been fortunate to travel the world directing commercials. 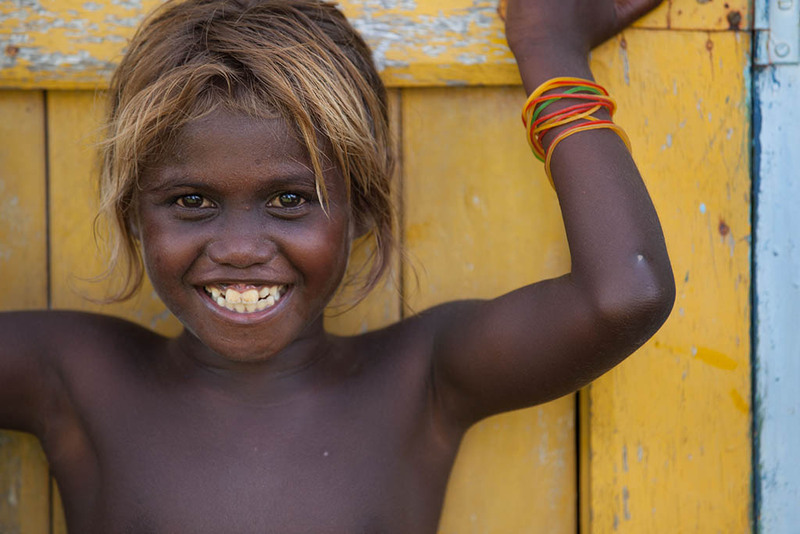 I have made acareer of finding rare beauty and being the very first to capture it, however, I have never had an opportunity like this, for my work to help create a lasting and positive impact on a magical place like Munda in the Solomon Islands. 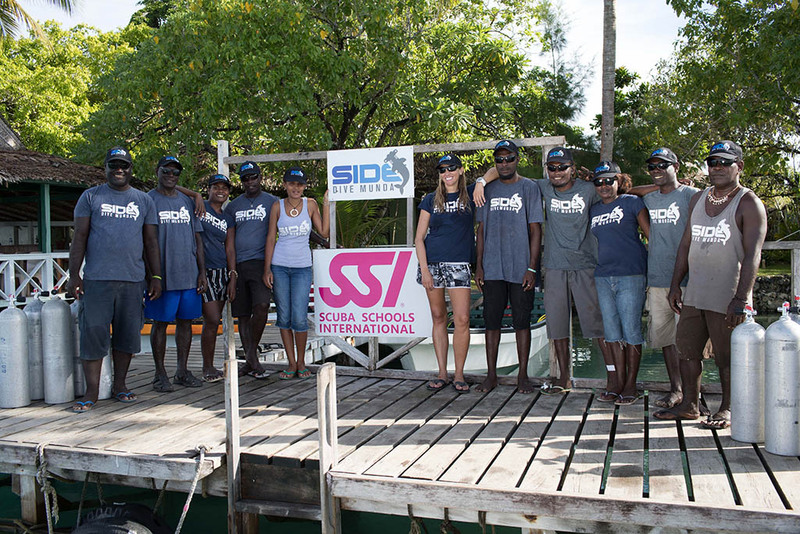 My hope is that by sharing my experience and images of our expedition with the dive community, that we will all help Belinda on her quest to preserve one of the last healthy underwater eco systems on the planet for future generations, by simply visiting Munda and diving this underwater paradise. Each person who books a trip gives strength to the theory of sustainable tourism and can be a powerful force at this crucial time in Solomon Island history. have soft bellies and they stick mostly to the swampy mangroves, but they do add exotic dimension to the stories and keep out meek vacationers, which I see as a total benefit.